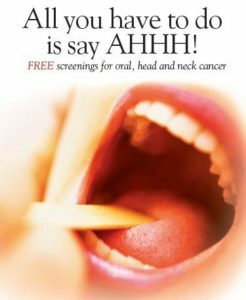 Since last year, we have spread head and neck cancer awareness by hosting a free screening to increase the awareness of this cancer in order to identify the risk factors, prevention and early detection. This year, we will do the same. Today only, receive a complimentary oral cancer screening with OralID. This new screening technology uses a fluorescence device to help visualize abnormal oral lesions, including potentially cancerous areas. It is pain-free, takes just a few minutes, and is easier to use than many screening tools used in medicine. 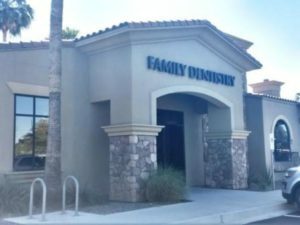 Walk-ins welcome, but please text 480-963-6300 to. Mercy Health – Franklin Avenue Family Care Center, 2213 Franklin Ave.
Because the best way to fight cancer is to prevent it. Free preventive screening for oral, head and neck. 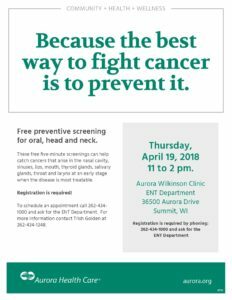 These free five-minute screenings can help catch cancers that arise in the nasal cavity, sinuses, lips, mouth, thyroid glands, salivary glands, throat and larynx at an early stage when the disease is most treatable. Registration is. Cleveland Clinic hosts a minority men's health fair attended by over 1200 men each year. The Head and Neck Institute offers free head and neck cancer screenings at this event each year.